This vineyard has sweeping views of Alexander Valley, and its elevation gives the vines cool mornings and milder temperatures at night. The Cabernet here develops elegant, graceful aromas and flavours, with characteristic currant, blackberry and cedar box. Aged 20 months in 96% French oak barrels, 40% new, with a medium to heavy toast finish. 93 points, Steve Heimoff, Wine Enthusiast, June 2010 "Beautifully soft and limpid. So pretty and polished now, with ultrafine tannins framing ripe, dry flavours of black and red cherries, currants, chocolate, herbs and smoky sandalwood. Dramatic and opulent, this 100% Cab was aged in 40% new French oak." 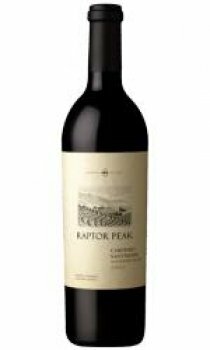 90+ points, Robert M. Parker Jr., The Wine Advocate, Feb 2010 "The 2007 Highland Estates Cabernet Sauvignon Raptor Peak (an Alexander Valley vineyard) is more feminine, elegant, and restrained, not as powerful and complex as the Trace Ridge, but more of a Margaux-like style of Cabernet Sauvignon, whereas the Trace Ridge more closely resembles a Pauillac/St.-Estephe style."